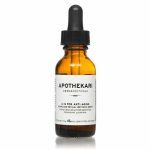 I’m not one for trying new skincare products given I had a regimen that I was content with already BUT am I glad I discovered Apothekari Dermaceuticals! My skin is noticebaly smoother, softer, refreshed-feeling, pores are minimized and I’ve received compliments on how youthful my skin looks. I love everything in this line and my favorite products include A is for Anti-Aging, the Bamboo Lemongrass Body Polish, the AHA-Mazing Exfoliating Cleansing Gel and the Bespoke Vitamin C 15% Serum. All are must-trys in my books! Thank you for treating my skin so well, Apothekari!